Internet is tricky in Cuba. This is pretty much an understatement, but the “why’s” require a much more expansive conversation to wrap our heads around the stakes. I will be visiting LA & San Francisco this month to discuss one of the most fascinating subcultures on the island today – the Tech sector. It’s been a long road for all things New Cuba regarding our gatherings to contemplate contemporary Cuban culture. Three years back, we gathered in the ballroom of The Standard Hotel in 2015 to talk about various creative industries — including music, art, and architecture. This year, it’s all about the Web, which of course affects the fate of all these creative and business endeavors. What appears as a fully disconnected country is truly the opposite. Like most things in Cuba, the people have found a way to “inventar”, creating digital solutions, thus turning your average grandma into a hacker, learning to circumnavigate Wifi hotspots in the most unusual ways. This Feb, two conversations will take place on the US West Coast, focusing on Cuba’s internet and its state of connectivity. RSVP confirmations are required for both. An extension of the Resolviendo Exhibit (which launched in Sept 2017), the Annenberg invited The New Cuba to co-host a special panel in Los Angeles on February 10, 2018 entitled Cuba: Sin Limites that gathers experts on the state of Internet in Cuba. Moderated by Cuban-American curator and digital strategist Jauretsi, speakers will include Dadne Carbonell (Cuban computer systems analyst), “Dany Paquete” (a kingpin of El Paquete Semenal, an underground weekly distribution of pirated international content via hard drives), and Susanna Kohly (Marketing Lead, Google Cuba). Please visit the Annenberg Wifi Cuba Panel page to confirm your attendance or read more on the event. You can learn more about Dany by viewing the documentary Give Me Future, currently downloadable on iTunes (trailer here). For a proper headstart, you can also now visit the art exhibit at the Annenberg gallery entitled Cuba Is, which contains a section called Resolviendo, an exhibit that The New Cuba helped curate with Commonwealth Projects. You’ll see photographs of Wifi Parks, a spectrum of videos from Cuba’s famous El Paqeute, and some DIY magazine culture Imagine the streets of Cuba’s content networks transported into an exhibit hall in Los Angeles. The original launch event took place early September 2017, with a big bash where I was lucky enough to helm the DJ booth with Matthieu Schreyer, host of the excellent KCRW show on Global beats. It was a bonafide Cuba love-fest in the heart of Los Angeles, complete with a “who’s who” of Cuban arts, film, photographers, curators, gallerists, and fans alike. The full exhibit will be up til March 4, 2018, so don’t forget to book out an afternoon to soak in all the beautiful photography before the panel. The next evening, Feb 11th, the topic continues nearby in San Francisco at the charming restaurant named Media Noche. This is a more casual gathering in a cafe setting hosted by a a group called Bay Area Cubans, lead by Project Binario’s Eddy Perez who we recently covered in our visit to Techcrunch. We expect our Cuban-American community to come out and celebrate our culture, gather for constructive conversation, and build awareness of future generations. Hermanos unidos. Like most Cuban-Americans, the topic of Cuba is passionate and immersive. Our belief is that it’s imperative for both our cultures, on and off the island, to grow a better understanding of each other for a brighter future. Building bridges, not walls. We invite any curious non-Cubans who would love to be part of the conversation. Im posting this information from the Freedom House website because the topic of Internet in Cuba is one of the most debated in my conversations. This data covers last year’s freedom of the press report (the 2012 report is being edited now and not yet ready). Cuba has the most restrictive laws on free speech and press freedom in the Americas. The constitution prohibits private ownership of media outlets and allows free speech and journalism only if they “conform to the aims of a socialist society.” Article 91 of the penal code imposes lengthy prison sentences or death for those who act against “the independence or the territorial integrity of the state,” and Law 88 for the Protection of Cuba’s National Independence and Economy imposes up to 20 years in prison for committing acts “aimed at subverting the internal order of the nation and destroying its political, economic, and social system.” Cuba’s legal and institutional structures are firmly under the control of the executive branch. Laws criminalizing “enemy propaganda” and the dissemination of “unauthorized news” are used to restrict freedom of speech under the guise of protecting state security. Insult laws carry penalties of three months to one year in prison, with sentences of up to three years if the president or members of the Council of State or National Assembly are the objects of criticism. The 1997 Law of National Dignity, which provides for prison sentences of 3 to 10 years for “anyone who, in a direct or indirect form, collaborates with the enemy’s media,” is aimed at independent news agencies that send their material abroad. In July 2010, the Cuban government promised the Spanish government, the Cuban Catholic Church, and the international community that within four months it would free the 52 prisoners, including 20 journalists and editors, still held since the 2003 crackdown on political dissent and independent journalism known as the “Black Spring.” By the end of the year, 17 journalists and editors and most of the other of the Black Spring detainees had been released. The Cuban authorities forced the released prisoners to leave the country in exchange for their freedom. They were immediately flown to Spain in a Cuban effort to marginalize opposition groups. Three journalists and several other dissidents involved in this case remained in prison at the end of the year, having refused the government’s offer of exile. While the release was a relief for journalists and their families after years of suffering, the gesture did not signal fundamental changes in freedom of expression for all Cubans, and the laws under which they were jailed remain in place. The U.S. government and some European leaders publicly stated that Cuba was moving in the right direction by releasing the prisoners, but the European Union (EU) decided to maintain its 1996 Common Position toward Cuba. The 27-nation bloc turned down Spain’s request to withdraw the doctrine, and continued to link improved European-Cuban relations to Havana’s progress on human rights and democratization. Journalists continue to be at risk of imprisonment or other severe sanctions if they engage in independent reporting or commentary. In a different case, Alberto Santiago Du Bouchet of the independent news agency Habana Press remained in prison at the end of 2010. He had been given a three-year sentence imposed in May 2009 for disrespect and distributing enemy propaganda. The government owns all traditional media except for a number of underground newsletters. It operates three national newspapers, four national television stations, six national radio stations, and one international radio station, in addition to numerous local print and broadcast outlets. All content is determined by the government, and there is no editorial independence. Cubans do not have the right to possess or distribute foreign publications, although some international papers are sold in tourist hotels. Private ownership of electronic media is also prohibited. Approximately 15 percent of Cuba’s population accessed the internet in 2010, but in most cases, they were connected to the government intranet and not the internet proper. Many citizens have access only to a closely monitored Cuban intranet, consisting of an encyclopedia, email addresses ending in “.cu” used by universities and government officials, and a few government news websites such as that of the newspaper Granma. Outside of hotels, only a few privileged individuals have a special permit to access the international network of the World Wide Web. The regime threatens anyone connecting to the internet illegally with five years in prison, while the sentence for writing “counterrevolutionary” articles for foreign websites is 20 years. However, the authorities do not have the means to set up a systematic filtering system. 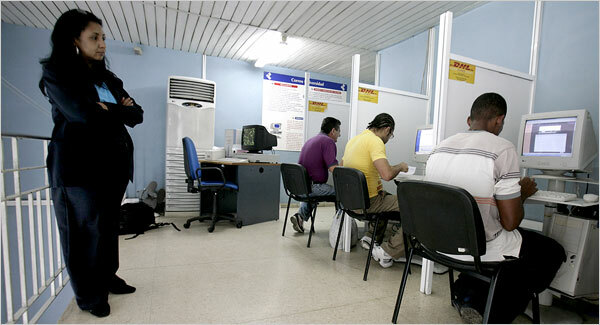 This forces the government to count on several factors to restrict internet access: the exorbitant cost of connections—about US$1.50 per hour from the points of access to the state-controlled intranet, US$7 per hour from a hotel to access the international network (the average monthly salary is US$20)—and infrastructural problems, particularly slow connections. Despite these restrictions, there is a small but vibrant blogging community. Bloggers in Cuba have yet to be jailed for their work, but they often face harassment and intimidation. Independent Cuban blogger Laritza Diversent claimed that the trials that characterized the crackdown in 2003 have been replaced by extralegal harassment, including official summonses and arbitrary detentions, and social and cultural marginalization. Some, such as Yoani Sanchez, have also been prevented from travelling abroad to receive awards for their work.